Here you can meet Dr. Chaney's staff. He thinks that they are the best, because they can work wonders at making a person's dental visit as pleasant as possible. appointments, and all of the other business of a dental office. She never loses her cool, and is loved by our patients because she is so helpful and nice to everyone. She is an expert at her job, and is a real authority on insurance. Dr. Chaney thinks nobody does it better! Tamara is the world's greatest dental assistant. She loves her work, and knows the job inside and out. She can perform a fluoride treatment on a child, and the child will go home thinking he or she had a good time. She can help a nervous person relax. 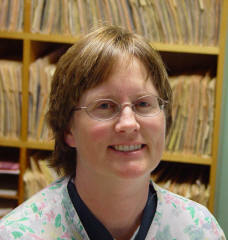 She can read Dr. Chaney's mind, so that he always has what he needs to do the best job in helping his patients. Her outgoing personality and sense of humor help keep patients at ease. she is done. She loves to laugh, and has a great sense of humor. No wonder she is so loved by our patients!